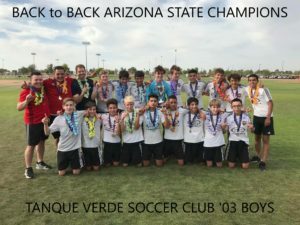 Below is a link to the TVSC 03 Boys Blue Go Fund Me page. This team won the State Championships for the second year in a row. They are trying to raise money to go to the Regionals in Hawaii. Thanks to everyone for their support, keep up the great work on the fundraising. We are getting closer to our goal.